We agree, parks are a wonderful place to have family photos taken! However, commercial activity, including commercial photography, is not permitted on public land. 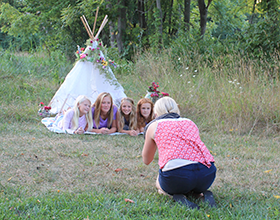 With a special permit photographers are permitted to hold photo shoots in CWPD parks. Photographers may receive a permit by submitting a request form and a $50 annual permit fee. Permits are valid in the calendar year they were received. We ask that photographers respect park programs and not hold photo shoots while programs are in progress.